A life without joy – what advantage does it have over death? Since having been stranded in Beirut following the 1967 War, I taught myself how to live in a place without being of it. This attitude helped me survive as a nomad and find joy wherever I came to rest. After being denied the right to live in my city of birth, anywhere in the world could serve as my base as long as my work continues to be my only veritable home. Indigenous peoples invariably say that they belong to the land not that it belongs to them, and indigenous belonging has such deep millennial roots that land is embedded in the language itself – oral, written and imaged; it is inextricably bound to their consciousness as a people. This is the substance of Kamal Boullata’s seminal essay ‘Visual Thinking and Arab Semantic Memory’, which discloses the depth of Arabic’s origins in the peoples’ experience and interpretation of their perceptual world.4 Furthermore, the historian Basem L. Ra‘ad demonstrates that the living language closest to Ugaritic – the pre-Biblical Bronze Age Cana‘anites’ linguistic system – is Arabic, confirming an inter-regional Eastern Mediterranean continuity of more than 3500 years, which undermines Zionism’s claim that the Palestinian Arabs arrived only with the 7th century AD Muslim invasion.5 It is to this profound sense of collective ancestral belonging to the land and to the language shaped by it that Boullata’s artistic, curatorial and writing practices bear witness. If art’s origins in love and loss provide one axis by which to approach Boullata’s work, another is his body of writings of which there are two strands. One comprises a number of essays attentive to the work and context of Arab artists and poets as well as curatorial projects that include exhibitions of Palestinian children’s art. The other is the collection of visionary essays, whose insights into the common origins of Arabic grammatical and visual forms are integral to the artist’s paintings, as the art historian Puerta Vílchez eloquently demonstrates.11 Like two instruments or voices in a ‘call and response’ musical score, each practice – painting and writing – inspires the other to a creative shift in register. At play is an arabesque in thinking that complements the contrapuntal dialogue in the artist’s painting between Arabic visual and verbal expressions. It produces in the paintings a synaesthetic resonance of the spectrum of Arabic geometric and rhythmic artistry, embracing calligraphy, architecture, music and poetry. The starting-point of critical elaboration is the consciousness of what one really is, and is ‘knowing thyself’ as a product of the historical process to date which has deposited in you an infinity of traces, without leaving an inventory. It is important therefore to make an inventory. Despite a substantial body of scholarship on the illegality, injustice and brutality of Israeli repression, speaking truth to power from Palestinian advocacy falls on deaf ears. From a Foucauldian perspective, Palestinian subjectivity has not been constituted from the ‘outside’ as a possible object of knowledge and bearer of a discourse of truth and hence is excluded from the political stage. Infinitely more troubling, however, is Judith Butler’s analysis of how peoples (and Palestinians figure largely in her discussion in Precarious Life) deprived of the means of self-representation – hence unrepresentable or misrepresented – risk becoming dehumanised ‘ungrievable lives’: ‘an ungrievable life is one that cannot be mourned because it has never lived, that is, it has never counted as life at all.’22 In this radical effacement of the Other, ‘there never was a human, there never was a life, and no murder has, therefore, ever taken place’;23 and there have been countless failures of justice for the loss of Palestinian civilian lives, both before and since Genet’s published observations following the torture and massacre of refugees at the Sabra and Chatila camps in Beirut in 1982.24 And yet, contrary to Ben-Gurion’s expectation, the refusal to forget animates Palestinian memory and unifies collective cultural identity irrespective of multiple geographical displacements. In truth, it may be impossible to forget when the unremitting accumulation of traumas under colonial repression and forced exile precludes closure. Said’s observation that Palestinians did not grasp the necessity to construct a collective history may have been true as a concerted enterprise, but it is precisely the course of action upon which Boullata, as an independent visual artist and writer, free from the institutional constraints of academia and propelled by the necessity of art itself, had embarked over a decade earlier. His rescue of Palestinian modernism and its socio-political context from historical oblivion is the incomparable achievement of Palestinian Art From 1850 to the Present. Perhaps even more radical, as Puerta Vílchez notes, are his subtle and intimate conversations between his practice as a visual artist and his researches into Arabic visual aesthetics. Thus, his inventory of the ‘infinity of traces’ of Palestinian collective memory in their aesthetic, international, historical and contemporary dimensions presents both a sustained act of resistance against the obliteration of the Palestinian Arab cultural past and recognition of a responsibility to the future. order to announce the steps beyond. Once again we may see the artist’s buoyancy and creative joy as a luminous cloud shape reflected upon the dark surface of a lake of sorrow. Were real (a man passing between two bombs said to me). Kamal Boullata has always had close affinity with poetry as both an illustrator and a translator. In 1970 he designed and illustrated A Lover From Palestine and Other Poems, which was the first bilingual anthology of Palestinian verse to appear in the USA. His figurative line drawings, frequently accompanied by swathes of Arabic script, do not ‘illustrate’ the text but provide analogous readings.36 These two modalities – drawing and text – were subsequently integrated into singular ‘abstract’ expressions in which the geometric rendering of word/images from Biblical and Sufic phrases in Arabic formed the architectonics of silkscreens he created in the mid-1980s. The articulation of poetry with image was exquisitely rendered in his handcrafted foldout artist’s books, and especially in the Granada Portfolio, completed in 1996. Following a sojourn in Granada together with the poet Adonis, he created twelve images for which the poet wrote ‘Twelve Lanterns for Granada’.37 The Portfolio consists of a case containing Adonis’s poem in two accordion books, in which complex folded paper dividers and hand-cut pop-ups pay homage to the Alhambra’s muqarnas, the vaulted architectural features frequently called ‘stalactite’ or ‘honeycomb’. These are harmoniously complemented with Boullata’s four silkscreen triptychs named for the four Rivers of Paradise, reflecting upon both the palace’s lustrous coloured mosaics and the centrality of water in Arabic architectural design. Boullata’s affinity with poetry expanded to published essays that penetrate the essence of Arabic visual aesthetics in poetic expression, most particularly in ‘Notes on Verbal Dominance and Visual Expression in Arab Culture’ – a revelation of how the poetic word has dominated the image in Arab aesthetic traditions. For all pre-literate peoples, orality is the means of transmitting collective memory and sensation, and as Boullata notes in this essay, since pre-Islamic times in Arab culture the poet was regarded as a visionary, a messenger of existential truth and a guardian of cultural inheritance. With literacy, the poetic utterance became visualised in the written word, in what Boullata calls ‘an aesthetic interchange between the sayable and the seeable’, acquiring divine status with the rhythmic prose verses of the Qur’an as the revealed word of God – light. Of all the Arab temporal and spatial arts indebted to the word – music and architecture – the art of calligraphy claimed the highest authority, whilst its geometric ornamentation through the arabesque, as Boullata notes elsewhere, echoed the rules of Arabic grammar.38 Thus, the rhythmic, geometric and spatial complexity of Arab visualised poetic expression underlines Boullata’s painterly researches, and his personal vision of the aesthetic dialogue between percept and concept, vision and sound, light and opacity, the visible and the invisible, in which light and colour – ‘staying faithful to the light’ – as expressed through the refinement of Arabic semantics takes precedence.39 To the extent that Boullata opens new pathways to understanding Arab aesthetics, he is no less a visionary than the traditional Arab poet. A silkscreen print from 1977, when Boullata was still engaged in political activism, is a design in Arabic square Kufic script in which the words are fractured as if seen through a prism. In silkscreens of the 1980s, this prismatic effect incorporated tonal colour shifts, and informed the artist’s essay, ‘Visual Thinking and the Arab Semantic Memory’ on the complex system of colour notation and symbolism in Arab culture. As the artist later noted, these works also reflect his visual memories of growing up inside Jerusalem’s Old City where shafts of light piercing through the spaces in its ancient architecture would take on a metaphysical resonance.40 Boullata’s paintings are seldom far from the love and remembrance of Jerusalem, the lost homeland, and in their reconfiguration of Arabic visual aesthetics parallel the work of another – albeit voluntary – exile, James Joyce, whose restless search to articulate his memories of Dublin likewise led to the reinvention of language. In time, the hard-edged shards of contrasting colour and tone characteristic of Boullata’s silkscreens give way to a softer touch in the square-formatted series of acrylic paintings, Surrat al-Ard.41 An intangible distance now infuses the image, achieved through blended colours whose light and transparency render space ambiguous. Boullata suggests this spatial elusiveness may be a metaphor of his attempts to reconcile the memory of Jerusalem with exilic estrangement: that haunting of the inaccessible of which Blanchot spoke. Homage to Sophronius, 1997, refers to the Arab Byzantine patriarch of Jerusalem, whose meeting with the Muslim conqueror, Caliph ‘Umar Ibn al-Khattab, in 637AD not only secured protection for Christians through the Umari Treaty, but also led to the construction of the Dome of the Rock. Boullata points out that the mosque’s octagonal floor plan is based on the intersection of two squares within a circle, representing the meeting between earth and heaven, and is identical to that of Jerusalem’s Byzantine Basilica of the Resurrection and the Ascension Church. The Dome of the Rock, he observes, ‘is a perfect architectural marriage between Byzantium and Islam’. Today, memory continues to be the connective tissue through which Palestinian identity is asserted and it is the fuel that replenishes the history of their cultural resistance. I want to learn more and more to see as beautiful what is necessary in things; then I shall be one of those who make things beautiful. Amor fati: let that be my love henceforth! I do not want to wage war against what is ugly. I do not want to accuse; I do not want to accuse those who accuse. Looking away shall be my only negation. And all in all and on the whole: someday I wish to be only a Yes-sayer! Misery and joy together complete the fundamental experience that we can have of being, of life, of the world, of others and of thought. Boullata’s entire aesthetic output, visual and textual, reflects a lifetime devoted to resisting by subtle, non-violent but fiercely single-minded means, the forces that seek to extinguish the Palestinian spirit and its capacity for joy despite ‘undefeated despair’.65 It is exemplary of what Caygill calls preserving the ‘capacity to resist’: ‘Motivated above all by a desire for justice, its acts are performed by subjectivities possessed of extreme courage and fortitude and its practice guided by prudence.’66 Boullata’s approach has been nothing less than the emancipation of thought: a refusal to succumb to the inertia of trauma; the retrieval and compilation of an inventory of Palestinian aesthetic histories, which, by excavating the past opens pathways for future research; and above all the disclosure that sorrow can also engender joy: ‘to see as beautiful what is necessary in things’. Nietzsche spoke often that one could not experience true joy without despair, and that the supreme source of joy was art. Like Nietzsche, Boullata does not ‘wage war on what is ugly’, or ‘accuse’, although in writings on his own exilic experience and that of other Arab artists he does not avoid telling socio-political truths. But his primary weapon of resistance is his engagement with Byzantine and Arabic aesthetics, the intimate exchanges between European and Middle Eastern scholarship, and their contemporary expressions in his own paintings, which open up a hitherto suppressed world of enchantment and joy that refuses to cede space to the ugliness that seeks to dominate life and thought. By finding inspiration in art that comes down to us from other times – as in the case of Byzantine iconography and Islamic art, both of which I grew up with – I sought through my painting to transform the reading of the beautiful in these affiliated traditions and render it in relation to our own time. That is how I invite viewers ‘to return to a present where [they] have never been’. What good is living if no one ever enchants the world? How and where to live if there is no enchanted place in the middle of these destructions? … To perfect the miracle, one can by turn immerse words and languages in the spell of a song (chant), whence comes the word enchantment. Essay commissioned for the catalogue to the exhibition Kamal Boullata… And There Was Light, London: Berloni Gallery, 23 September – 31 October, 2015, pp 49 – 77. 1 Ugaritic school text, ca.1500BC, quoted in Basem L. Ra‘ad, Hidden Histories: Palestine and the Eastern Mediterranean, London: Pluto Press, 2010, p 107. 2 Alexander Barakat, An interview with Kamal Boullata, Interviews, Contemporary Practices: Visual Art from the Middle East, volume v, 2009, p 178. 3 For a succinct analysis of how the Palestinian landscape is being systematically transformed through the transfer of populations, enclosure and destruction of Palestinian patterns of economy and society, see Gary Fields, ‘Landscaping Palestine: Reflections of Enclosure in a Historical Mirror’, International Journal of Middle East Studies, no 42, 2010, pp 63-82. 4 Kamal Boullata, ‘Visual Thinking and the Arab Semantic Memory’, in Tradition, Modernity, and Postmodernity in Arabic Literature, ed. Kamal Abdel-Malek and Wael Hallaq, Leiden: Brill, 2000, pp 284-303. 6 John Berger, ‘Undefeated Despair’ in Hold Everything Dear: Dispatches on Survival and Resistance, London and New York: Verso, 2007, p7-19. 7 Boullata, Foreword, Steve Sabella: Photography 1997-2014, Ostfildern: Hatje Cantz Verlag, 2014, pp 6-8. 8 Jacques Derrida, Memoirs of the Blind: The Self-Portrait and Other Ruins, trans Pascale-Anne Brault and Michael Naas, Chicago and London: University of Chicago Press, 1993, pp 49–52. 9 Maurice Blanchot, ‘Two Versions of the Imaginary’ in The Space of Literature, trans. Ann Smock, Lincoln: University of Nebraska Press, 1982, p 258. 10 Boullata, ‘Geometría de la lengua y gramática de la geometría’, Quadernos de la Alhambra, Vol 27, Granada, 1991, pp 11-12. Translated into Spanish by José Miguel Puerta Vílchez, this essay originally appeared in Arabic as ‘Fi handasat al-lugha wa qawa’id al-raqsh’ (‘On the Structure of the Arabic Language and the Grammar of the Arabesque’) in Mohammad Arkoun et al, Al-Islam wa-l-Hadatha (Islam and Modernity), London: Saqi Books, 1990, pp 17-38. 11 José Miguel Puerta Vílchez, ‘Chromatic Geometries of Light’, in the exhibition catalogue, Kamal Boullata: Homage to al-Hasan Ibn al-Haytham, Dubai: Artspace Gallery, 2009; and Puerta Vílchez, ‘Introduction’, Kamal Boullata: Bilqis, Dubai: Meem Editions, 2014, pp 11-21. 12 An inventory of artists as writers would include, from the past, Alberti and da Vinci, Kandinsky, Klee and Duchamp, Ad Reinhardt, Patrick Heron and Robert Smithson, and among contemporary practitioners, Rasheed Araeen, Jimmie Durham, Susan Hiller, Lee Ufan and Adrian Piper. 13 In his essay ‘Journeying Through Transparency’, Boullata refers to Arab scholars of mathematics and geometry who inspired aesthetic principles of harmony and beauty, additionally noting the Indian and Arab sources of the ‘Fibonacci’ numerical progression, inherent in natural formations and in the conception of axial and floral arabesques. In Kamal Boullata: Bilqis, pp 29-43. 14 Puerta Vílchez, ‘Chromatic Geometries of Light’. Alhazen’s most influential extant work is Kitāb al-Manāzir (The Book of Optics). See Hans Belting’s analysis of Ibn al-Haytham’s investigations of perception and optics as the ground upon which the concept of perspective in western painting has been based since the Renaissance: Florence and Baghdad. Renaissance Art and Arab Science, trans. Deborah Lucas Schneider, Cambridge: Harvard University Press, 2011. 15 Boullata, ‘Journeying Through Transparency’, p 38. 16 Antonio Gramsci, Selections from Prison Notebooks, 1971, ed. and trans. Quintin Hoare and Geoffrey Nowell Smith, London: Lawrence and Wishart, 1986, p 324. 17 Mahmoud Darwish, extract from ‘On this Earth’, 1986, in Unfortunately, It Was Paradise, trans. and ed. by Munir Akash and Carolyn Forché with Sinan Antoon and Amira El-Zein, Berkeley: University of California Press, 2003, p 6. 18 Edward Said, ‘Invention, Memory and Place’, 1994, in Landscape and Power, 2nd edition, ed. WJT Mitchell, Chicago and London: University of Chicago Press, 2002, p 250. 19 Gabriel Piterberg, ‘Erasures’, New Left Review, 10, July-August 2010. 20 Michael Bar Zohar, Ben-Gurion: The Armed Prophet, New Jersey: Prentice-Hall, 1967, p 157. 21 Howard Caygill, On Resistance: A Philosophy of Defiance, London: Bloomsbury, 2013. 22 Judith Butler, Frames of War: When Is Life Grievable?, London and New York: Verso, 2009, p 38. 23 Judith Butler, Precarious Life: The Powers of Mourning and Violence, London: Verso, 2004, p 147. 25 Paul Ricoeur, ‘Memory and Forgetting’ in Questioning Ethics: Contemporary Debates in Philosophy, eds. Richard Kearney and Mark Dooley, London: Routledge, 1999, p 9. 26 Whilst the 1948 National Catastrophe (Nakba) names the death and displacement of 750,000 Palestinians, the Six-Day War created a further 300,000 refugees displaced from the remaining territories of Palestine. 27 The assaults on Palestinian cultural heritage include the looting of personal and institutional artworks, antiquities and libraries from 1948; a campaign of assassination or imprisonment of Palestinian intellectuals and potential cultural leaders, amongst the first of whom was Boullata’s friend, the writer and translator Wael Zuaiter, murdered in Rome in 1972; the looting and confiscation by Israeli forces during its invasion of Lebanon in 1982 of the national archives of the Palestine Liberation Organisation (PLO), which included valuable and rare collections of films and other Palestinian cultural artefacts (nytimes.com/1982/10/01/world/Israeli looted archives of plo officials say; the closure of art exhibitions, confiscation of artworks and imprisonment of artists throughout the 1970s and ‘80s as Boullata reports in Palestinian Art From 1850 to the Present; and in 2001, the theft of archives from The Orient House, East Jerusalem: ‘The Looted Archives of the Orient House’, Journal of Palestinian Studies, issue 13, 2001. 29 Boullata, ‘Notes on Verbal Dominance and Visual Expression in Arab Culture’, in Neighbours in Dialogue, eds. Beral Madra and Ayse Orhun Gultekin, Istanbul: Norgunk Yayinciliki, 2005, pp 11-20. 30 Boullata, Presentation to the Palestinian Art Symposium, Palestine c/o Venice collateral event, 53rd International Art Exhibition at the Venice Biennale, June 4, 2009; see also Boullata’s overview in ‘Innovation in Palestinian Art’, in Neighbours in Dialogue. 31 Palestinian Art From 1850 to the Present, Introduction by John Berger, London: Saqi Books, 2009, is an English language publication complementing Boullata’s earlier anthology in Arabic, Istihdar al-Makan: Dirasat fi al-Fann al-Tashkili al-Filistini al-Mu’asir (The Recovery of Place: A Study of Contemporary Palestinian Art), Al-Munazammah al-‘Arabiyyah lil-Tarbiyyah wa-al-Thaqafah, wa-al “Ulum, Tunis: ALESCO, 2000. 32 Boullata, ‘Classical Arab Art and Modern European Painting: A Study in Affinities’, The Muslim World, Vol LXIII, No 1, Jan 1973, pp 1-14; and ‘Journeying Through Transparency’, pp 29-43. However, the essay ‘Modern Arab Art: The Quest and the Ordeal’, is an analysis of the extent to which Arab modernists uncritically imitated certain European pictorial styles. In Mundus Artium. A Journal of International Literature and the Arts, Vol. x, no 1, 1977, pp 107-133. 33 Adonis, excerpt from ‘The Edge of the World’ translated by Adnan Haydar and Michael Beard. From Mihyar of Damascus: His Songs by Adonis. Rochester, New York: BOA Editions Ltd., 2008. p 103. 36 A Lover From Palestine and Other Poems: An Anthology of Palestinian Poetry, ed. Abdul Wahab al Messiri, illustrated by Kamal Boullata, Washington DC: Free Palestine Press, 1970. For further information see his exhibition catalogue, Drawings for a Text, Washington DC: Attiyeh Foundation, The Gallery of the Art Department, Catholic University, 1982. 37 See the scholarly account by Puerta Vílchez, Introduction, Kamal Boullata: Bilqis. 38 Boullata, ‘Geometría de la lengua y gramática de la geometría’. 39 Boullata, ‘Visual Thinking and the Arab Semantic Memory’, pp 284-303. 40 Interview with Kamal Boullata, Tarīqah, United Arab Emirates: Barjeel Art Foundation, 2014, p 23. 41 Boullata explains that in mediaeval times, Surrat al-Ard (the ‘navel of the earth’) was the name given to Jerusalem. In ‘To Measure Jerusalem’, Journal of Palestinian Studies, XXVIII, no. 3, (Spring 1999), p 90; republished in Palestinian Art From 1850 to the Present, pp 325-336. 42 Boullata, ibid, pp 86-87. 43 Boullata, ibid, pp 88-90. 44 Boullata, ‘Airborn’, in Between Exits: Paintings by Hani Zurob, London: Black Dog Publishing, 2012, pp 112-147. 45 On Gazan children’s attempts to break the Guinness world record on simultaneous kite flying, see ‘Flying Paper’, 2013, dirs. Nitin Sawhney and Roger Hill (flyingpaper.org/trailers); progressive.org/kids kite flying gaza; and Emily Ratner, ‘Dreams of Flying – Welcome to Gaza’, Counterpunch, June 10, 2009 accessed 05.06.15 On parkour, see Youtube ‘We Want to be Free: Escaping Gaza through Parkour’, 2015; and ‘After Banksy: Parkour in Gaza’, 2015, videos produced by PK Gaza. 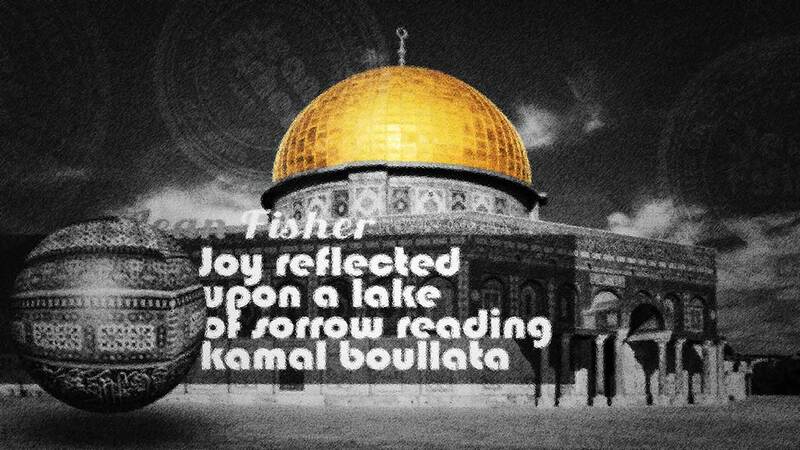 46 Boullata, Introduction, Mahmoud Darwish: Stranger in a Distant City, Washington DC: Arab American Cultural Foundation, 1981. 47 Boullata, ‘To Measure Jerusalem’, p 90. 48 Bilqis is the Arabic name of the Queen of Saba’, or Sheba. 49 Boullata, ‘Journeying Through Transparency’, pp 29-43. 50 Boullata, Palestinian Art From 1850 to the Present, p 103. 51 Friedrich Nietzsche, The Gay Science, Section 276, 1882, trans. Walter Kaufmann, New York: Vintage Books, 1974, p 223. 52 Michel Serres, The Troubadour of Knowledge, 1991, trans Sheila Faria Glaser with Willian Paulson, Ann Arbor: University of Michigan Press, 1997, p 33. 53 Boullata, Between Exits: Paintings by Hani Zurob, London: Black Dog Publishing, 2012. 54 At this time, Boullata designed posters, logos and other campaign materials to promote Palestinian national and human rights alongside illustrating books of poetry and the sleeve design and notes for a compilation of Fedayeen songs, Palestine Lives! Songs from the Struggle of the People of Palestine, 1974, Paredon Records, New York. 55 Boullata, Faithful Witnesses: Palestinian Children Recreate their World, Preface by John Berger, Brooklyn: Olive Branch Press, 1990, p 16. 56 Jacques Rancière, The Ignorant Schoolmaster, 1987, trans. Kristin Ross, Stanford: Stanford University Press. 1991. The author maintains that knowledge arises when the ‘tutor’ and the ‘pupil’ engage in a reciprocal, non-hierarchical dialogue. 57 Boullata, Children’s Joy and Dying in the Homeland: My Experience As Graphic Designer in Support of Palestine, forthcoming publication. In 1984 Boullata also designed two computer programmes ‘Boullata I and II’ to promote children’s appreciation of geometric art. 58 John Berger, Preface, Faithful Witnesses, p 9. 59 jadaliyya.com/pages/index/2762/witnessing-the-censored-exhibit_a-childs-view-from-Gaza; electronicintifada.net/content/gaza-childrens-images-war-censored-under-pressure-us-israel-lobby/10373; Laura Brown, ‘A Child’s View from Gaza Art Exhibit Postponed’ Global News, April 24, 2013. 60 The assaults on Palestinian children by killing, incarceration and intimidation are well documented by legal and human rights organisations and cannot be elaborated here. 61 Gilles Deleuze, The Logic of Sense, 1969, trans. Mark Lester with Charles Stivale, ed. Constantin V. Boundas, New York: Columbia University Press, 1990, pp 304-321. 62 Boullata, ‘Facing the Forest’: Israeli and Palestinian Artists’, Third Text, no 7, summer 1989, pp 77-95. Republished in Boullata, Palestinian Art From 1850 to the Present, pp 248-276. 63 The Peace Treaty with the names of its initial signatories is reproduced following Boullata’s essay in Third Text. 64 Boullata, ‘‘Asim Abu Shaqra (1961-1990): The Artist’s Eye and the Cactus Tree’, Palestinian Art From 1850 to the Present, pp 183-203; and Boullata, ‘Reading the Body in Marwan’s Painting’, in Marwan, New York, The Armory Show: Meem Editions, 2015, pp 1-18. 67 Boullata, ‘Journeying Through Transparency’, p 32.